Can anyone give me some insight as to how to pull the passenger side injector closest to the front of the truck? Been making noise when reving over 3k, finally ran injector cleaner through it and now it’s making an immense amount of noise whenever it’s not idling. I ordered an injector cleaning apparatus that you pressurize and hook directly to the fuel rail, but I’m not so sure it’s going to do the trick. I’ve got a trip I scheduled to go up north in beginning of May and I need to use my truck to tow my trailer, so I’ve got to have her running by then. 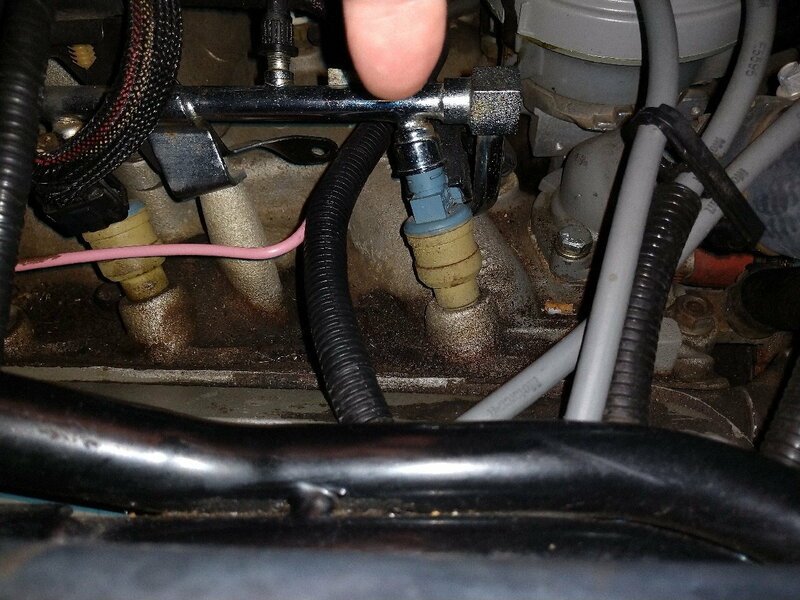 What is the easiest way to replace or just to pull that one injector? My manual says to pull the upper intake but I’m not sure why. I’m worried I’m about to open a can of worms...can any one give me some insight? Thanks. I first up my fuel raIL VERY CAREFULLY,. THEN i YANK THE INJECTOR STRAIGHT UP MAKING SURE THE CONE COMES WITH IT. USING NEW O-RINGS UP AND DOWN, PUT IN THE NEW INJECTOR,. CAREFULLY REPLACE THE FUEL RAIL. Oh hell yeah. Thank you guys. So i do need to unbolt the entire fuel rail do just one though. If I end up replacing all of the injectors, can I just pick up some 24lb 4 hole injectors, unbolt fuel rail, remove old injectors, and pop in the new ones? There’s no other sequence I need to do? On my 89, my injectors were pretty tight in there, but I didn't have to dismantle too much to get them all out. I'm not sure I fully pulled the rail, think I just popped it up out of the way. I usually just pull one side...penetrating oil helps alot to get rid of the old dried up o rings on the old injector. Yes, I usually change them out to multiports which is why it's so important to get the pintle cap fully out of the intake manifold. Awesome thanks. This will be my first attempt at injectors on any vehicle, but it doesn’t look too bad as these are all out in the open, and it sounds like I don’t have to pull the upper intake manifold. The injector I think I’m having trouble with spins around pretty effortlessly, so hopefully they all pop out for me easy. Are there any special tools I should have on hand to do this job? Also, I’m pretty sure it’s my injector, it’s making a loud fwap fwap fwap that settles down at idle after a bit and gets loud when I rev it up. Can anyone comment if I should be looking at anything else? I hit it with my stethoscope and it’s only coming from that one cylinder and is felt very strong in the fuel rail. I’m just hoping I didn’t throw a rod or burn a valve. Thanks for the advice, changing oil tomorrow and then will pull injectors.